GOQii unveiled a new platform for disease management that will focus on two core lifestyle diseases – Hypertension and Cardiac Care. As part of this, GOQii is launching “GOQii Vital”, with a color screen activity tracker, Blood Pressure Monitor and Heart Rate Sensor & GOQii Play in addition to the existing features on the GOQii platform. The new GOQii Vital band is designed to help monitor key vital stats like Blood Pressure and Heart Rate. It can report both Systolic and Diastolic pressure with a good degree of accuracy. However, it is not a medical device and not a replacement to a Sphygmomanometer (an instrument for measuring blood pressure). Patients with hypertension should consult their doctor before use. GOQii Vital is water proof and its features include – Color OLED Touch Screen, Steps, Calories, Distance, Heart Rate, Blood Pressure,Sleep, Sports Mode (Running, Workout & Cycling), Notifications, Alarms and an inbuilt USB Charger. Vital has a battery life of upto 7 days depending on usage. GOQii has recently also partnered with Max Bupa Health insurance on it’s GoActive Product to provide health coaching to its customers with a focus on wellness. “With GOQii Vital we have become the first company of its kind, to integrate a blood pressure monitor & heart rate in an activity tracker with the ability to seamlessly share the data with doctors, health experts. Data along with the right advice will help encourage people to pursue holistic healthcare regime and focus on a preventive health mindset,” said Vishal Gondal, Founder and CEO of GOQii. GOQii has also launched the first of its kind live video offering, ‘GOQii Play’. 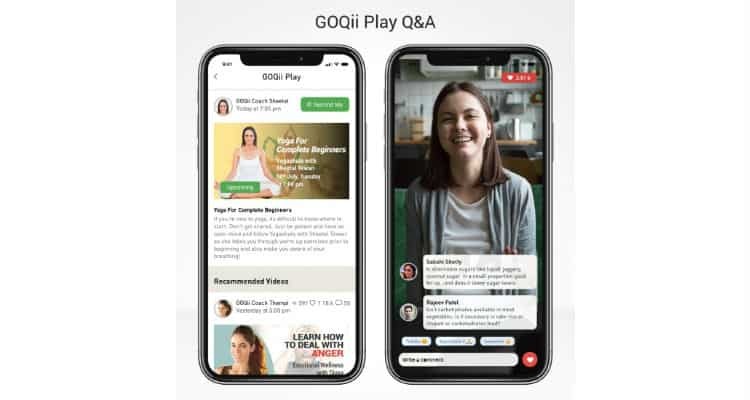 GOQii users can access live videos featuring various health experts, doctors, fitness trainers, emotional health counsellors & health influencers on the GOQii App at various time slots through the day and interact with them via the videos and have their questions clarified in real time. “GOQii Play” has been added to an existing array of features like GOQii cash, GOQii health store, Arena, Digital Health locker, HRA, diagnostics, doctors ad expert consult, insurance and many other health focused offerings. GOQii Vital will be available with a 3 Months GOQii Coaching plan for INR 3499. As part of the launch, GOQii Vital will be available exclusively with Amazon and GOQii Health store. GOQii Vital will be premiering during the Amazon Prime Day 16th July 2018. GOQii launches ‘Vital’ Band, a Color tracker with Blood Pressure Monitor + Heart Rate 0 out of 5 based on 0 ratings. 0 user reviews.